Our latest tournament was held August 6th on Lake Mohave out of Cottonwood Cove Marina. As stated on numerous occasions in the past on these pages Lake Mohave is either a great day's fishing or as tough a bite as you will find anywhere. In the month of August you can sometimes add "Hot" to describe the fishing but you can always add it to describe the weather.... It is the middle of the desert after all. Hot was the term of the day.... in describing the weather...... the fishing, on the other hand, was as cool as the other side of the pillow. Doing the best job of finding the hot spots this month were the team of Dave Hoover and Craig Mackey. Now, Dave is pretty well considered one of the best in the club on Lake Mohave. He has been fishing the lake most of his life and almost always does well in the tournaments down there. This month thanks in part to Craig for boating two of the fish, he managed yet another win with 3 fish for 4.10 pounds. 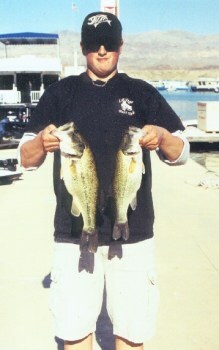 Second place this month goes to the team of Tyler Brinks and Kevin Guadalupe who brought in two fish for 3.70 pounds. Third place was Tom Puleo fishing by himself who's one 2.20 pound fish earned him the big fish money. Congratulations to our top finishers.